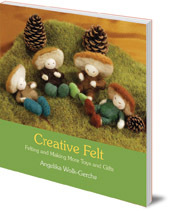 Now in an expanded edition, this book teaches you how to make felt itself, as well as an even wider range of toys and gifts, such as beautiful hats, brooches and dolls, with no previous experience. Felting has been a popular craft for thousands of years, and felt is a remarkably versatile and easy-to-use material. Now in an expanded second edition, this book teaches you how to make felt without the need for specialist tools. The book also has instructions for a wealth of things to make from felt and this new edition includes an even wider range of toys and gifts. The step-by-step directions and clear colour photographs will guide you through each stage of the felt-making process. Even if you have never used a sewing needle before, the templates and ideas provided will have you making beautiful hats, brooches and dolls in no time! Angelika Wolk-Gerche was born in 1951. She studied design in Hanover and became an art teacher. She now works as a freelance illustrator and textile designer, as well as running courses in arts and crafts. She lives near Stuttgart, Germany and is the author of More Magic Wool and Papercraft (both Floris Books).